Several newspapers in Sierra Leone have had their knuckles rapped by the country’s Independent Media Commission (IMC), after investigating complaints of breaches of the media code of conduct. 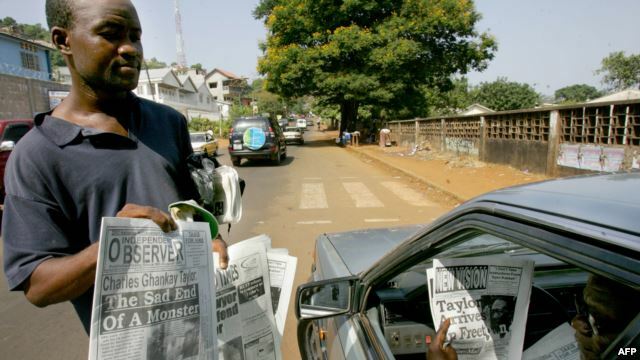 But the total sum announced today by the IMC, is far less than the historic fine levied against one of the country’s most popular newspapers by the courts in Freetown over three years ago, for defamation of character, estimated at over £8,000 (eight-thousand British Pounds Sterling). Journalists and proprietors of newspapers in Sierra Leone are struggling to come to terms with the need to balance the media’s right to inform, educate and entertain, with the individual’s right to privacy. And this balance they must get right, if they are to avoid the rising cost of IMC fines, which media analysts say could cripple most of the country’s newspapers if they are not careful. But can newspapers in Sierra Leone avoid publishing stories they honestly believe to be in the public’s interest as well as of interest to the public, for fear of financial penalties or even threats of arrest – based on ‘orders from above’ as political tension rises in the country? What successive governments in Sierra Leone – including the current Koroma regime, have succeeded in doing, is the politicisation of the media and the creation of a culture of intimidation, harassment and false arrest, in order to curb the powers of the media. And as today’s announcement by the IMC once again demonstrate, most of the complainants are from a political class, that is becoming rather increasingly touchy and sensitive to media reports, ‘deemed to be damaging to their character and reputation’. But corruption in high places has become a serious problem in Sierra Leone, costing the country an estimated $500 million a year. With a media watchdog and a justice system that many in Sierra Leone believe to be justifying their existence, based largely on the protection it offers the political class and their interests, it is very difficult to see how the media industry in Sierra Leone can survive the rising cost of IMC and court fines and penalties. A fine of Le 1,000,000 (one million Leones) has been imposed on the NEW STORM NEWSPAPER, in line with Section 36 (3) of the IMC Act of 2000 as amended in 2006 and 2007. The newspaper had published an article on the front page of its publication volume 4, No.345, Tuesday 18th September, 2013, headlined ‘’SLPP STUDENT EXPOSE JOB ON CORRUPTION AND EMBEZZLEMENT’’. He said the article was meant to expose him to ridicule, contempt and hatred within the SLPP and the General Public, and secondly it was intended to soil and tarnish his exemplary leadership legacy bequeathed to the SLPP in 2013. (Photo: John Benjamin). During its deliberations, the Committee found out that the article breached the accuracy provision in the IMC Code of Practice. The newspaper should publish in its next edition, a retraction with due prominence,(front page) and to write a letter of apology to Mr. John Benjamin. Mr. Benjamin said the article was unfounded, unjustified and malicious, and that it was meant to expose him to ridicule, contempt and hatred within the SLPP, and the general public, and to tarnish his exemplary leadership legacy bequeath to the SLPP in 2013. He also said that the article led to unaccountable public insults, molestation and threats on his person, which he can no longer endure, as the public saw him as the person who had caused the SLPP to fail because the articles were accusing him of being on the payroll of the President (Ernest Bai Koroma), among other things. The committee found that the two publications had breached the accuracy provision in the IMC Media Code of Practice and that the said publications were defamatory, as they had tarnished the reputation of Mr. Benjamin, and lowered him in the eyes of right thinking members of the public. The Newspaper should also publish in its next edition, a retraction with due prominence (front page) and to write a letter of apology to Mr. John Benjamin. A complaint against THE AYV NEWSPAPER by Hon. Augustine Torto for ‘’publishing misleading and malicious publication against him on the front page of the AYV publication vol.4 , No. 42 published on Monday 23rd February, 2015, titled ‘’HON. TORTO IN DEBT, OWES SALHOC Le 2, 750,000.00. Hon. Chief Torto said he did not know where the AYV newspaper got that figure, as he had not been contacted to verify the story. He said he was one of the most exemplary tenants of SALHOC, with an unblemished record. He submitted a copy of his receipt of payment to SALHOC. The committee finds that the newspaper did not cross-check the story with Hon. Torto before publishing the article, and therefore in breach of the accuracy provision of the IMC Code of Practice. The Complaints Committee has dismissed a complaint against THE SALONE CHAMPION NEWSPAPER by Councillors of the Freetown City Council for an article headlined ‘’ACC may arrest FCC Mayor. The matter came up three (3) times for hearing, and on all three occasions, the complainants (FCC Councillors) were absent, but the newspaper editor was present. In light of the above, the Committee was left with no option but to dismiss the matter for want of appearance in accordance with the IMC Code. (Photo: Mayor of Freetown – Mr. Gibson). The Committee frowns at such acts of making complaints without appearance before it. The Editor of THE NEWS WATCH NEWSPAPER has been given a stern warning and asked to do necessary correction to a misleading and misinformed article on the IMC published in his publication of Friday 1st May, 2015. The Editor Mr. Santigie Kamara was asked to appear before the Complaints Committee to justify certain statements in his publication bordering on the operations of the Commission. He appeared before the committee on the 12th May, 2015, and after responding to questions from the committee, he accepted that certain aspects in the article were not well researched, and were therefore misleading and misinforming to the public. He was given stern warning and asked to do the necessary corrections to the article. The Editor of METRO NEWSPAPER, Mr Eddie Momoh has appeared before the Complaints Committee to justify the publication of pornographic and indecent material in his newspaper publication of Friday, 27th February, 2015. The Editor, Mr. Eddie Momoh apologised for the said publication and promised not to publish such material in the future. He was given a stern warning by the committee and advised to desist from such. Sia Koroma – a willing tool in political infamy?